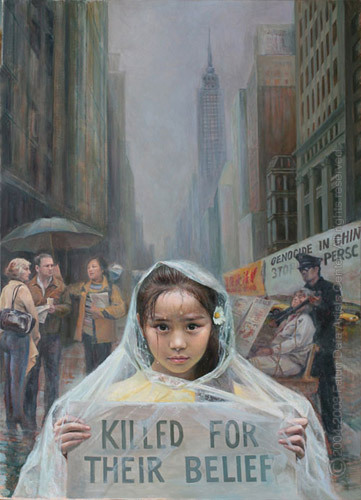 The World Organization to Investigate the Persecution of Falun Gong (WOIPFG) tracks and investigates reports of transplant operations in China where the organ donors are believed to be Falun Gong practitioners, custom-killed for their organs. Many cases have been investigated since news of these organ harvesting atrocities first came to light in 2006, with the grim results confirming that the allegations of illicit and illegal organ harvesting are true. Many of those killed were Falun Gong practitioners who refused to reveal their identities to police when arrested. Hospital records report such donor identities anonymously, with numbers used in place of names. The evidence suggests that such illicit transplants occurred at the highest rate sometime around 2003. Information about such killings is much harder to come by today, as the cloak of secrecy has been tightened. Nevertheless, the organ harvesting atrocities continue to this day. Please do what you can to help stop these atrocities. Encourage the media to report the situation. Ask your elected officials to demand that Chinese authorities put an immediate end to organ harvesting atrocities, and to allow independent investigators to enter China to document what is and has been happening. Write to the United Nations, NGOs and others who you believe can help. When enough of us stand up and cry for justice, we will be heard and the atrocities will end. WOIPFG has compiled a complete record of evidence gathered. Please contact WOIPFG directly for more information. This report presents a list of hospitals and organ transplant centers confirmed by WOIPFG to be involved in organ harvesting from living Falun Gong practitioners. Many more hospitals and transplant centers are believed to participate, and investigations are underway to confirm. For each hospital listed here, the report below gives the address, driving directions, a brief description of what is known about the facility, and a transcript of the telephone call (translated from Chinese) between WOIPFG investigators and hospital officials. These telephone calls provide a great deal of evidence. Surprising as it seems, hospital officials were quite open about the source of the organs when these calls were made. The investigators making the calls posed as parties interested in arranging organ transplants. Hotline Telephone (010-51128318) will answer popular questions from patients concerning pre and post surgery. A: Hello, Are you Xiao Chen? A: Hi, how are you? Last time I talked to you about contacting the kidney supply sources. How is it going? A: Yes, the source of Falun Gong practitioners, I meant. A: Alright, besides it, how could you be so sure he (the source) was a Falun Gong practitioner, did you find out for sure? B: How to positively identify as a Falun Gong practitioner, well, when the time comes — when the time comes our side, our Boss will have people showing you information, you know, he will show you the information and data, you can be sure. B: They have all the information and data, even including individual resumes. B: Of course. There were tons of Falun Gong’s on file around 2003. A: That is what I mean; it was much easier for you to get the organs for the operation at that time, right? B: Ah, since 2003, I tell you the facts, I handled two cases in 2003, and I started in 2003. B: You are talking about what’s going on around 2003 time frame. I knew exactly what you were talking about. They did not reveal their name starting from 2003. B: Last time I made some inquiries by calling around, —- Falun Gong — Later I contacted that site by phone, I asked my boss to call him, and he said they needed to obtain from inside there. B: Now they were all transferred to remotely located prisons, they need to get some from there, getting from there means the money, the money must be paid mostly to people over there, you know. A: But I tell you, on the other hand, right now it is very stringent, and they should not ask too much. You know that several years ago, they secretly detained many Falun Gong practitioners who went to appeal but did not provide their names. There was no records, no registrations. B: Yes. Over here, like over there it is quite normal, you know. He — did not — did not give out his name. Let me tell you, even if he did not give out his name, he would leave a code name, understand? B: Such people who did not give out names all had code numbers. I know this better than you. They had code number 8, they had —. All had codes in the record file. A: Oh, so it is like this. If they only had the codes, they should also have the real names in the record. These should be in there, right? A: Oh, OK. Just one more question. B: We… I tell you. To tell you the truth, what we have here all belong to this kind. We have connections with government officials. There are connections to high ranking officials. You know, I will show you such material even if you don’t ask me for it. You know. B: This… I cannot tell you anything about that. B: I will not tell you too much about our business. Whatever is going on high up on our side, there are rules for everything, you know. B: I…I…I cannot, dare not say anything, you know. A: Yes. Can I meet him before the organ transplant? B: Right now they are somewhere in the prisons. They are in prisons now. Normally, they were sent away from Beijing if they were arrested in Beijing. If they were arrested in other places, they were detained in local prisons. Normally they are sentenced to 10 years, 8 years, or something like that. There are many such cases. A: Ah, so it’s not detention centers, nor labor camps, right? B: It is in detention centers, it is in detention centers. After some Falun Gong practitioners were sentenced, with some sentenced to more than 10 years. They were transferred to other places for sure, you know. B: Right now it’s impossible to leave it to you. They cannot give you the material at this time, you know. B: Like our boss, like the connections to the detention centers, I cannot tell you. This, when the time is right… you…Let me tell you in advance…making sure…You know, such as these names I cannot tell you, you know…Such confidential things I cannot tell you. Otherwise, we cannot do business in the future, you know. A: I understand what you said. I only want to ask you two things. I want to know these things. First I want to see this person. I want to know where he came from. I want to make sure that he is really a Falun Gong practitioner. Another thing, the doctor who is going to get the kidney, I want to know if he really has the skills, not just an ordinary policeman. It is not acceptable if the quality is not guaranteed. B: That’s for sure. What you said I cannot take casually. How can it be casual? We have the contacts. Since we are doing this business, we have people in every department. How can you get it done without connections? B: Such operation is like a supply line, you know. A: Can you tell me how can I find you? B: Do you know where the No. 307 Hospital of the Chinese People’s Liberation Army is? A: No problem. I can find it. Where specifically within the No. 307 Hospital? B: You don’t need to go to the in-patient Department, just show up at the entrance of the hospital. B: Do you know where the No. 307 Hospital is located? A: Yeah. Since we never met before, we should have a contact sign. B: Don’t worry about it. When you arrive at the hospital entrance, call me. I will be upstairs, so I can spot you. I can recognize you when you show up. The Organ Transplant Research Center at the General Hospital of the Chinese People’s Armed Police Forces was originally set up in 2001 as the Liver Transplant Center of the hospital. It was jointly established by the General Hospital of the Chinese People’s Armed Police Forces and the Oriental Organ Transplant Center. It is the largest liver transplant center in Beijing, specializing in the clinical and research field of liver transplants. The center is led by Professor Shen Zhongyang, a renowned Chinese liver transplant specialist. Under him is a team of professional liver transplant experts, including surgeons, ICU doctors, liver disease doctors, anesthesiologists, pathologists and nurses. About 200-300 liver transplants are performed in the center each year. Tianjin No. 1 Central Hospital is located in the south-western part of Tianjin City. It’s at the south-western corner of the Central Loop Highway, underneath the Fukang Highway overpass. One can take the #50 or #854 bus and get off at the Wangdingti station. Or take the #847 bus, and get off at the Rongqianxili station. One can also take the #638 or #640 bus and get off at the No. 1 Central Hospital station. The operation rooms are on the 11th and 12th floor. For visiting transplant patients there are several hotels available: The Huaxia Hotel (3rd, 4th, 5th, 6th floor reserved exclusively for patients); Tiancai Hotel (24th and 25th floor reserved for patients). The Oriental Organ Transplant Center (OOTC) claimed: Up to 2004, 2,248 accumulated organ transplants had been performed at OOTC. Among them, there were on average 300 kidney transplants and 600 liver transplants per year. Their yearly liver transplant volume broke the world record held for nearly 10 years by the Pittsburg University Organ Transplant Center. At the OOTC 2005 Year End Review Conference: In the whole year of 2005, 647 home-position liver transplants, and 436 kidney transplants were performed in the center. In the category of multiple organ transplants: 21 combined liver-kidney transplants and 2 pancreas-kidney transplants were completed. According to information revealed by the Korean Daily, the Tianjin No. 1 Central Hospital established a record of 44 liver transplants in one week in December 2004. Based on 5 working days per week, the daily average was 8.8 liver transplants. Center Director Professor Shen Zhongyang: He performed 4 liver transplants in 4 days; he supervised 3 liver transplants and 3 kidney transplants in one day; he successfully performed 4 liver and 6 kidney transplants in two days. He also successfully directed 2 liver and 6 kidney (a total of 8 organs) transplants in one day. By March 17, 2005, leading the world, Professor Shen Zhongyang completed his 1600th liver transplant. He also went to over 40 hospitals in 10 provinces and cities in China to provide consultations on transplants, and help promote liver transplants. Some patients’ family members revealed to Fenghuang Weekly that as many as 24 transplants of livers and kidneys had been performed in this center in one day. A: Hi. Is this the Tianjin First Central Hospital’s Director Song? Fudan University, affiliated with the Zhongshan Hospital, claims: Our hospital developed one of the earliest organ transplant programs in the country. At present, we have fully developed kidney, liver, heart and lung transplants, and became the only hospital in the nation that is capable of performing transplants for large organs such as kidney, liver, heart and lungs with complete in-house resources. A: Hello. Is this the Zhongshan Hospital? A: Is this the Liver Transplant Center? A: Hi. Are you a doctor? Can you do transplant surgery? C: About a week after you come. C: What we have here is all this type. A: Oh, the good ones all come from Falun Gong practitioners and they are fresh, usually within how many hours? C: It should be OK within 24 hours, but we generally control it within 10 hours. A: Could you tell me who should I contact with about it? C: You need to talk to the court system. A: Do you get them from other areas? Or you have them locally? A: I see. So you have both out of town and local supplies. Bus routes include: #63, #13, #17, #65, #55, #21, #6, #61, #123, #231, #14, #220, #223, #910, #100 and #848. Brief Introduction: So far, 2012 kidney transplants have been completed in this hospital, with 150 cases yearly. From 2001 to January 2006, 473 liver transplants were performed. Up until now, a total of 520 liver transplants, 22 liver and kidney combination transplants, and 6 kidney and pancreas combination transplants have been completed. This is the number one hospital in the city of Shanghai. B: Greetings. This is the No. 1 Adjunct Hospital of Shanghai Jiaotong University. A: Hello. May I have your number of the liver transplant center? C: Let me tell you, it should be OK to have a liver transplant in your case. A: I just want to know how long we have to wait. C: We have supplies everyday. Today for example, we are performing transplant surgery. C: Sure, the organs we use are all from live persons. C: They are all live organs! Ours are the best. A: Then I want to know how long you have been in operation. I want to find out your skill level. C: We’ve done this for 5-6 years. We have performed such kind of operation for 5-6 years already. A: Then how many do you do per month? C: We have done 400 to 500 cases. A: What? 400 – 500? A: So you do 400 to 500 transplants every year? C: No. This year we just started after the Chinese New Year, but so far we’ve done more than 10 cases, 20 to 30 cases already. Each year we did about 100 to 200 transplants. A: All these organs, they must come from healthy persons. We need the healthy one. C: I’ll make sure that you’re satisfied after you come. A: I heard some come from those who practice qigong. They are very healthy. C: Yes, we have this type, but I cannot explain to you clearly over the phone. A: If you could find me one, I will come right away. C: Of course. Just come over! A: Oh, you could. Then how do I find you? What’s your last name? I will look for you. C: The ‘Dai’ as in ‘dai mao’ (=wear a hat). From the railroad station take the K51 bus, or from the Bus Depot take K68 that will reach the hospital directly. Or, one can take K56, K93, #79, #62, #31, #16, #64, #115, #117 or K68, getting off at the Qianfoshan Provincial Hospital station. Zang Yunjin: Associate Professor, Deputy Physician-in-charge, Director of the Liver Transplant Department and Director of the Oriental Organ Transplant Center (in Tianjin). Transplant Center Director Zang Yunjin: Physician Member of the International Liver Transplantation Society (ILTS), Associate Director of the Chinese Medical Society’s Shandong Province Organ Transplant Professional Committee. In September 2001, he joined the Tianjin No. 1 Central Hospital Organ Transplant Department and the Oriental Organ Transplant Center after returning from studying abroad. He performed liver transplants under the guidance of Professor Shen Zhongyang. He is now fully capable of independently performing transplant operations. He also successfully supervised over 100 liver transplant cases at many hospitals in Hebei, Henan and Shandong provinces. He joined the Liver Transplant Institute at the General Hospital of the People’s Armed Police Forces in January 2005, performing liver transplants. He is the Deputy Director of the institute, as well as Physician-in-charge and a Professor. So far, he has completed more than 300 cases of liver transplants and participated in the once-more liver transplant, as well as the liver-kidney combination transplant. A: Hello. Is this the ward of the Shandong Qianfoshan Liver Transplant Center? B: Please wait. I’ll get a doctor for you. C: We’ve started since 2002. A: From 2002 to present? C: More than four years. A: As for the liver supplies, usually how long do you keep them? C: There is a rule of 12 hours. So far we haven’t exceeded 12 hours. The ones we have are all pre-checked. A: I heard that some livers come from Falun Gong practitioners. So I want to know if you have this type or not? C: Um. You just need to come. A: So you mean you have this type? C: Well, let me tell you, you just come over…er…we will surely get more of this type in April and the number of those suppliers is gradually increasing now. A: Why will there be more in April? C: I cannot tell you that because it involves… it doesn’t mean…Anyway, there is no need to explain this to you. This question can’t be answered. From Wuchang Train Station: Take the #609 bus and get off at the Hangkonglu (Hangkong Road, or Aerospace Road) station; you can also get off at the Tiyuguan (Stadium) station. From Hankou Train Station: Take the #512 bus or #79 bus. Take the shuttle bus from the airport and get off at the Hangkonglu (Hangkong Road, or Aerospace Road) station, then walk towards Jiefangdadao (Liberation Blvd) and you are right there. The Tongji Organ Transplant Research Institute at the Huazhong University of Science and Technology was the earliest established large scale multiple discipline research organization, engaging in organ transplant basic studies and clinical trials in China. It is now a major national laboratory belonging to both the Ministry of Education and the Ministry of Health. At present, it’s capable of 16 different types of demanding and difficult organ transplants, including heart, liver, kidneys, spleen, pancreas, as well as combined pancreas/kidney, liver/intestine transplants, and many abdominal area multi-organ transplants. Among them, close to 2500 kidney transplants were performed. Since the start of heart transplant plan in 2002, 12 successful cases have been completed. A: Hello. Is it the Wuhan Tongji Hospital? A: Are you the Urological Surgery Department? We need to have a kidney transplant. B: Yes, this is the Kidney Transplant Department. A: When did you start the large volume of kidney transplantations? B: We are the earliest place. We started a long time ago. A: How many operations do you do each year? B: Our hospital is the place where the largest amount of transplants have been done. In the whole Hubei Province area, our department is the most productive one. We’ve done a lot because we have ample organ supplies. A: From a patient’s perspective, a live kidney source is preferred. So we are looking for live organ transplantation from prisoners, for example, from those who practice Falun Gong. Is it possible? B: Sure, it’s not a problem. A: So do you get enough supplies of live organs from prisoners such as those who practice Falun Gong? B: Yes, sure, no problem. When you are ready, you can come over directly and we will discuss it in detail. A: Hi. Is this the No.2 Affiliated Hospital of the Hubei Province Medical University? A: What about kidney sources from prisoners who practice Falun Gong at your place? B: It is also called the Wuhan General Hospital. We share with each other. Department of Urology Address: Wuhan General Hospital, Residence Hall, Front Building 3rd Floor.